Make more time for yourself and bring your bathroom bang up-to-date with the latest bath and shower technology. Whether you want to sit back and soak while catching up with your favourite show or take singing in the shower to the next level with digital surround sound, we have the perfect innovation for you. At European Bathrooms we’ve been designing, supplying and installing designer bathrooms and shower rooms across Buckinghamshire, Berkshire and the rest of the south-east for over two decades. As well as ensuring the finest finish in all aspects of decoration, flooring and tiling, we can install a host of latest smart bathing and showering accessories, transforming your bathroom into a truly immersive luxury space. 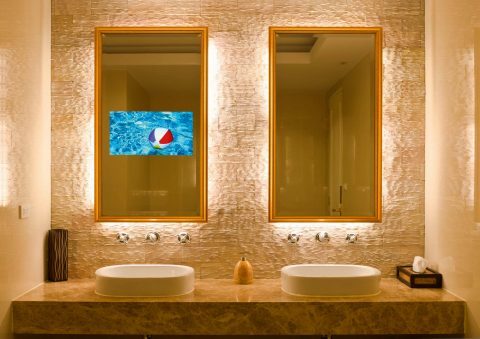 Bathroom TVs and Media Suites – Waterproof TVs are 100% safe to use in a bathroom environment which means you can catch up on your favourite programmes at any time of day, from getting ready in the morning, to winding down at the end of a long day. Surround Sound - Speakers can be integral, fixed into the ceiling or even positioned under the shower for maximum effect. Screen Sizes - Screens come in a variety of sizes, from a compact 19-inches to a super-size 42-inches, and comprise heated glass, so stay condensation free. Flush-fit or Wall-mounted - For a sleek, subtle finish, our waterproof TVs can be wall-mounted or flush fit, which means they are fitted into the wall with a back box. Is it a Mirror or a TV? - Both! For a totally unobtrusive appearance, we can customise your TV to look like a contemporary glass mirror, so unless the TV is switched on, you wouldn’t even know it was there. Internet Access – Using your mobile in the bathroom can cause a range of problems, from mist build-up to complete loss of service if it’s fully immersed in water.The latest bathroom TVs can also incorporate internet access, allowing you to search online, stream music, watch videos and catch up with social media and emails. Precision temperature control – An integral thermostat checks the water constantly to ensure it maintains your desired temperature. Colour change dials – Dials flash as the water heats up to your set temperature (which takes a matter of seconds) and then stay static to indicate it’s ready, so there’s never any hot/cold temperature surprises. 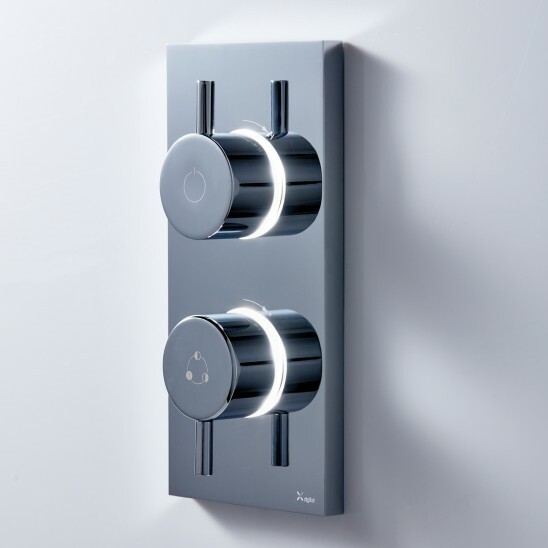 Switch streams – Want to divert water to the bath, or switch from hand held to over-head shower? You can change the water flow with a touch of a button. Digital water delivery – Models such as Crosswater’s Digital has its own app (currently for iPhones) which helps save precious snooze minutes by enabling you to run your shower or bath remotely from bed, or anywhere else in the home. You can browse a selection of Crosswater digital showers and fittings at our modern bathroom showrooms in Amersham and Windsor. Jacuzzi® Whirlpool Baths – This leading brand of whirlpool baths may have been around for over sixty years but the engineering behind its hydrotherapy technology is refined constantly to deliver the best, ‘bubbliest’ bathing experience. The brand’s unique water jet technology sends an invigorating stream of air and water into the bath, in turn massaging different muscle groups. The clever part is that the pressure of the jets can be adjusted to high or low, allowing you to target areas of tension, such as in the neck, back and shoulders or simply lie back and have a super-soothing, relaxing bath. As well as creating your ideal massage strength, the Jacuzzi range provides innovative features such as touch technology and remote control, making the experience effortless too. Like to know more about our hi-tech bathroom technologies? Call into our Windsor or Amersham showrooms. Crosswater Digital Showers: The MPRO dual outlet from Crosswater’s Kai collection provides absolute control over water temperature and comes with a one-touch remote control option, so you can even start your shower remotely. (Image courtesy of Crosswater). Wash while you watch! Find out more about latest Aquavision waterproof TVs at European Bathrooms. (Image courtesy of Aquavision).